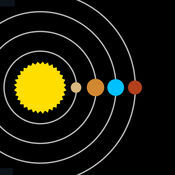 SUMMARY: This app allows the user to scroll through the solar system, exploring the planets in 3D. Click on the information symbol to find out more about each planet including figures and images. This app is a great way for children to gain a greater awareness of the planets in relation to one another. TOP TIP: This app is best used to see the planets in 3D and understand their location in relation to each other.